Explore the beginning of the Guild Wars universe without limits. 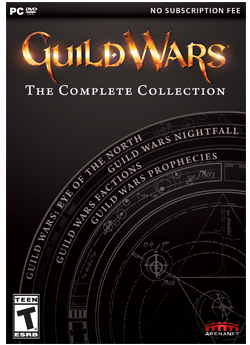 Experience all of the classic campaigns and expansion content, fully customize your playstyle, and forge an enduring legacy with the Guild Wars Complete Collection. Begin your journey in any of the three award-winning standalone campaigns: Guild Wars: Prophecies, Guild Wars: Factions, or Guild Wars: Nightfall. Choose from ten professions to create your heroic character, and personalize your gameplay by combining hundreds of skills, weapons, and armor sets from every corner of Tyria. With the Guild Wars: Eye of the North expansion pack, the achievements, titles, and prestigious rewards you earn in Guild Wars will unlock exclusive rewards in Guild Wars 2! Use the Hall of Monuments Reward Calculator to keep track of your points and see the heirloom items your Guild Wars 2 characters will inherit. Bonus Items: to claim your bonus items type /bonus in the chat window while logged into the game. Bonus M.O.X. : Find and speak to M.O.X. with a level 10 character to obtain the golem hero.